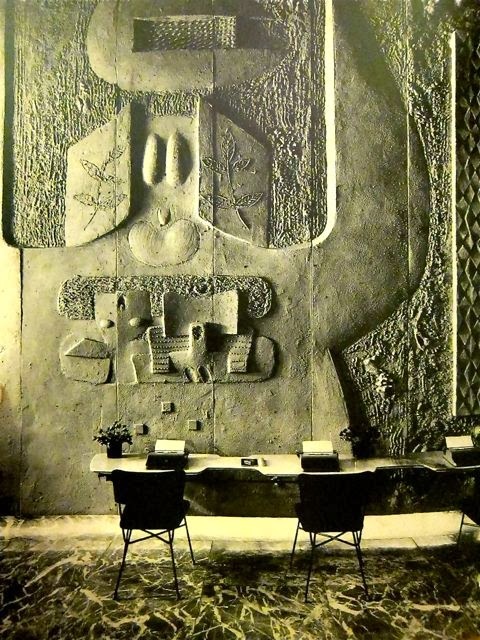 I am snowbound here in the Midwest and thinking of Constantino Nivolo's sunny midcentury garden. It had a fully enclosed solarium (accessible by ladder and block-staircase) with mural-covered concrete walls that must have been scorching in summer but was designed to allow sunbathing even in a New York winter. When I think of the Hamptons, I mostly think of conspicuous celebrity house parties and overpriced lobster. 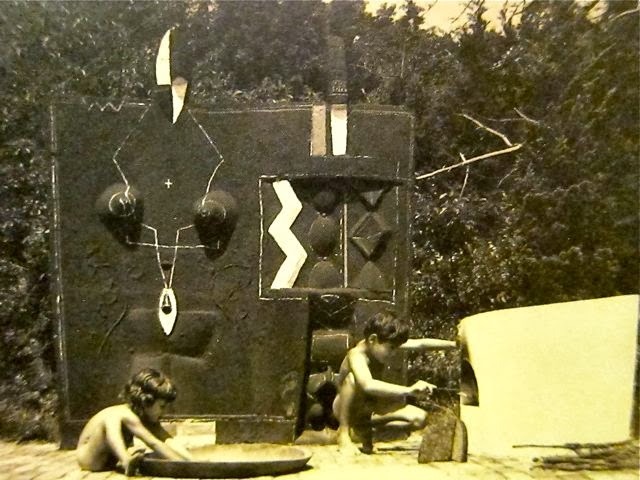 But in the 1950s, when a "postwar wave of artists, architects, and writers" swirled out of New York City, "East Hampton was a vital center of the American avant-garde. Back then, before all the traffic, people in the Hamptons argued about art, not real estate." The best documentation of the uber-cool landscape where Jackson Pollock, Willem de Kooning, Mark Rothko, and Franz Kline hung out--smoking and lounging in Bertoia chairs, natch--and the house where Corbusier painted a mural on the living room walls is a 2001 New York Times article by Alastair Gordon from which the quotes in this post are taken, and the book Weekend Utopia: Modern Living in the Hamptons also by Gordon. 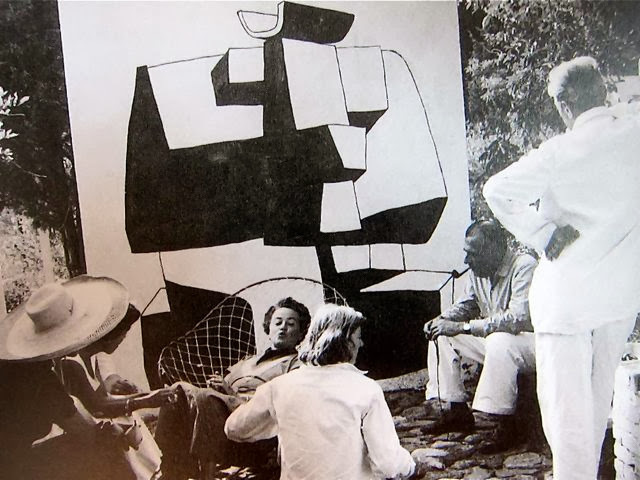 After restoring and painting the 18th century farmhouse he had purchased in 1948 (with white walls and New York taxi-yellow floors, and Corbu painted his mural with leftover house paint over a long weekend in 1950) sculptor 'Tino' Nivola turned his attention to creating a pleasure garden, an outdoor gathering space for friends, in the grounds. Bernard Rudofsky (author of ''Architecture Without Architects: A Short Introduction to Non-Pedigreed Architecture,'' and a lecturer with the best presentation title EVER: "How Can People Expect to Have Good Architecture When They Wear Such Clothes?") helped with the layout, suggesting "a sequence of ''rooms'' using paths, free-standing walls, fences and landscaping to create what he called an interplay of wall surfaces, sunlight and vegetation. ''The garden became an extension of of the house -- an open-air house,'' said the Nivolas' son, Pietro, 56, who grew up in the house with his sister, Claire" . It seems very British, the garden room ideal. But Nivola was Sardinian, and originally a mason, and these rooms are sketched out in grape arbor and stucco, with bread ovens and fireplaces and a very Mediterranean mood. He did most of the work himself, including planting a tight circle of cedars that eventually grew into its own narrow, shady chamber. 'My father was always creating these kinds of intimate spaces,'' Claire Nivola said. ''It's a bit like Orani, his hometown in the central part of Sardinia. Every wall and roof is at a different angle and height, with very narrow streets and little piazzas everywhere.'" "Near the center of the garden, a whitewashed fence of horizontal slats defines one room. 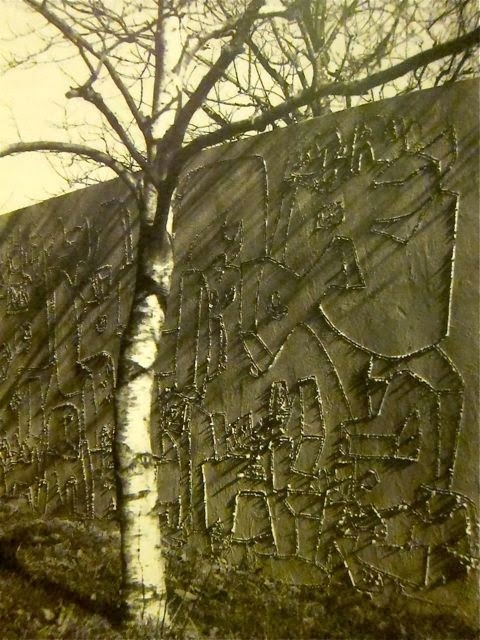 Perpendicular to it is a concrete wall where, before it set, Mr. Nivola inscribed allegorical figures that appear to be marching to war. A third wall is suggested by a line of evenly spaced trees, while a sculpted fountain rises from a bed of lilies of the valley." A terrace with a free-standing fireplace, a tall chimney and barbecue grill forms the next space. 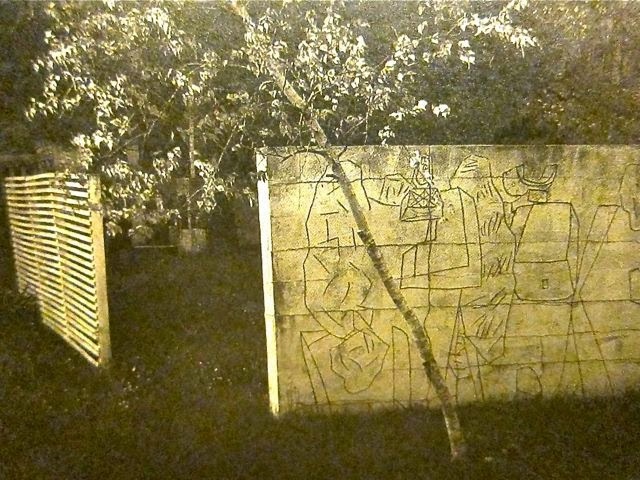 Another wall has a square window through which the branch of an old apple tree was allowed to grow. 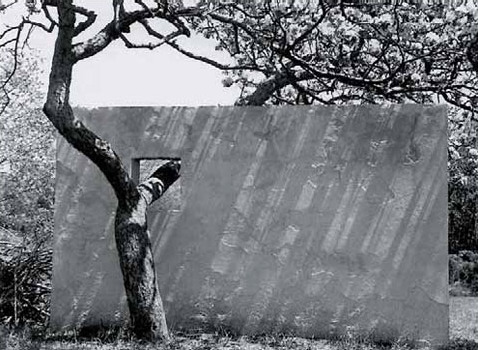 The "tree window" wall was designed so that shadows fell across it like a kinetic mural. Rudofsky said that it was both a foil and a projection screen. Over time, the garden was filled with Nivola's concrete sculptures and later his sand-casts, a patented process he developed while playing at the beach with his children. "My father was very good at making sand castles,'' Pietro Nivola said. ''He loved to sculpt with wet sand on the beach. Then one day he wondered what would happen if he poured fluid plaster over the forms he had made.'' He painted the castings with different colors. 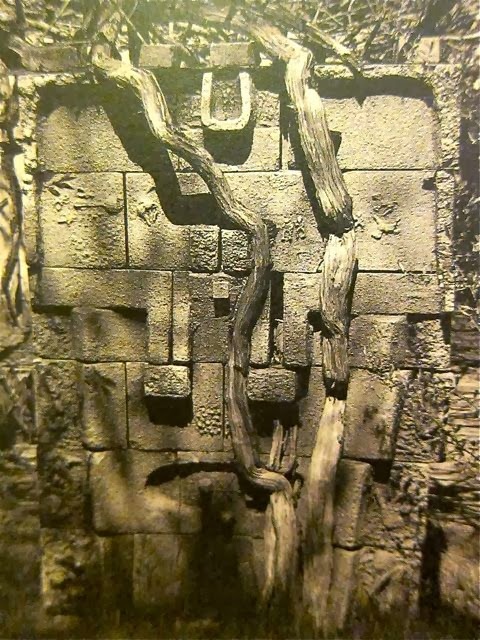 This technique made for a fairly primitive and rough-edged kind of work..." eventually used in his most famous works, large bas reliefs for the Olivetti typewriter showroom in New York. See, Apple wasn't the first to realize that design sells what are basically office tools. 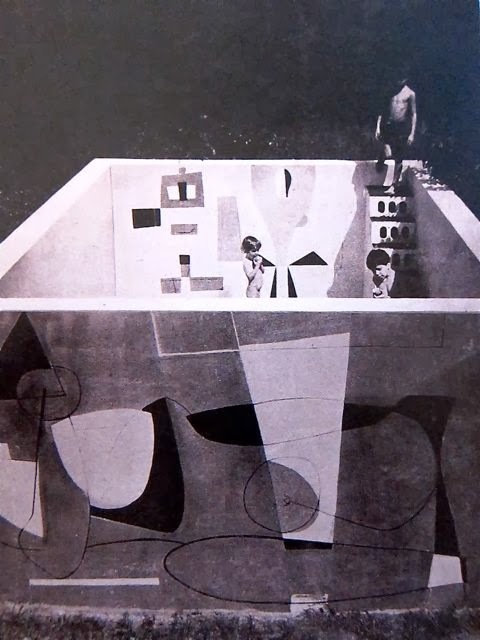 But in the Hamptons, it was all much more casual...Nivola mixed batches of concrete and let the children sculpt with him, and intentionally used a paint for the murals that would wash off after a couple of years so they could be painted again. 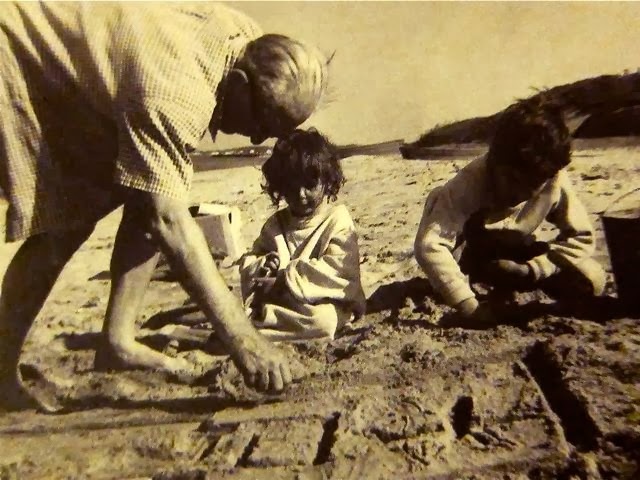 And Corbu wandered down to the beach and to make his own sandcasts with the kids. Golden moment, indeed. 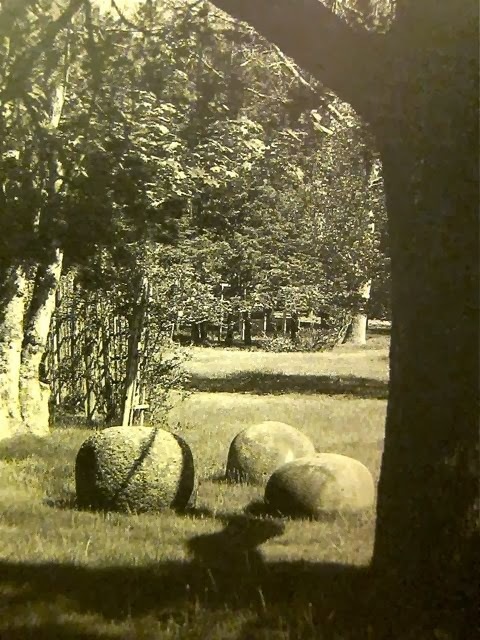 After Tino's death in 1988, the garden continued to live and breathe with the addition of his daughter Claire's own sculpture. In 2012, the house and grounds were renovated and preserved and at the time of this writing they remain in the Nivola family. All the photos are via the blog mondoblogo; see lots more there. See the story of the renovation and contemporary photos of the house here. See also the foundation and museum devoted to Nivola's works. P.S. Apologies for the lack of blogging lately; I have been deep in The Cave of The Writing of The Book. But I think I've written enough now that I can breathe again. I feel like I haven't breathed in six months. This is so interesting! Thanks for a unique glimpse into a little-thought-about field. I would love to know where in the Hamptons this garden is. 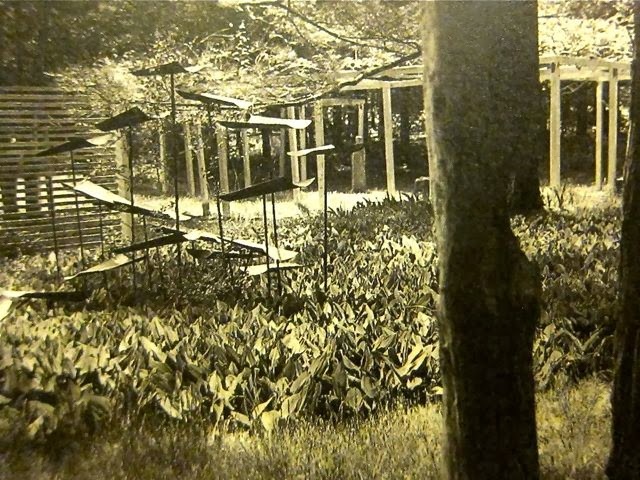 I grew up spending summers in "The Hamptons" before they became "The Hampstons" and would like to visit Nivola's garden. Glad you posted again and good luck with the BOOK. This is so inspiring. Thanks! Wow! Thanks for taking a breather from the solitude of the book to post this! 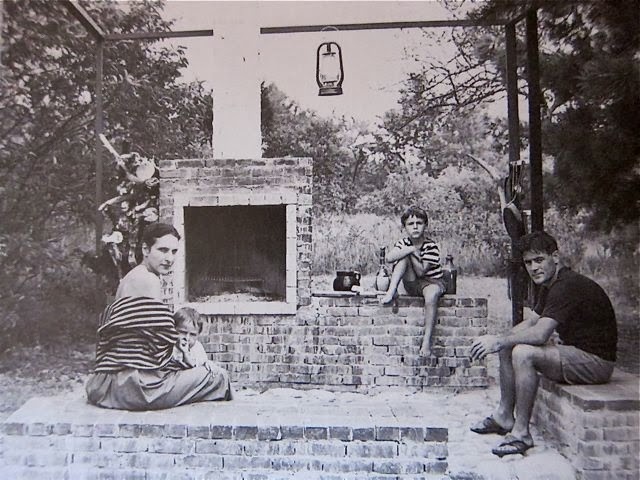 Not only is there a wonderful glimpse of the Hamptons back in the day, but the fun and creativity the Nivola family enjoyed I think could only have helped the creative professionals who visited to get a dose of that free spirited enthusiasm to keep them going in their work. Truly a garden/landscape at its best! If you're interested in a distraction from writing that comes from the left coast, take a look at some of the articles about California Oaks, Western sycamores, and the history of landscape exotics at this site.